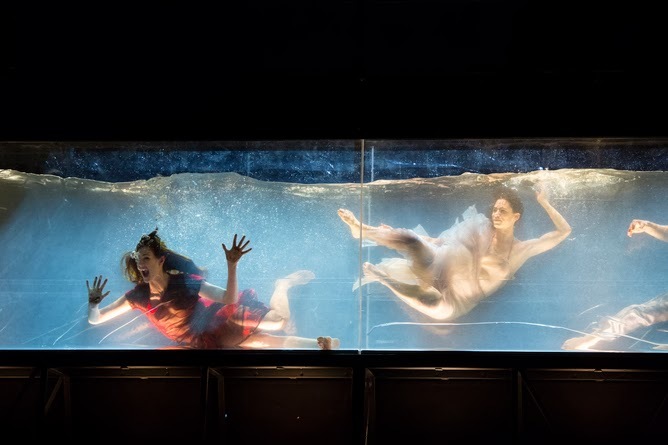 The Sydney run of Sasha Waltz's Dido and Aeneas is in its last night tonight. The reception has been mixed, but mainly positive and occasionally enthusiastic. And I say 'Sasha and Purcell' because it really revolves around Purcell's extended score, which is quite delicious, and the dance. This is dance with singing, not singing with dance. I don't remember too many Didos in Sydney but that said, Sydney Philharmonia Choirs did it last year with the luscious Fiona Campbell and now I especially regret not going. Nor did I go to Joan Sutherland's first concert in Sydney when aged 21 (1947) she sang Dido. So there's form in this town. In a penny pinching move, I'd chosen seats on the side in the stalls about six rows from the front forgetting what a poor theatre the Lyric is for live unamplified music and voice. 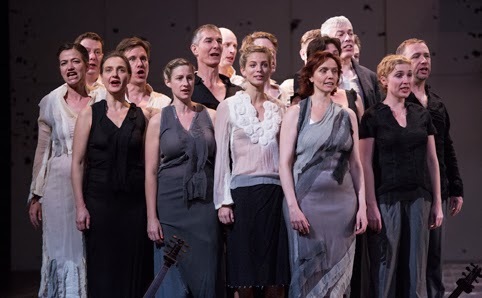 So poor that they had to resort to amplifying the orchestra, the Akademie Für Alte Musik Berlin beautifully directed by Christopher Moulds. We were just in front of a speaker! The balance was skewed and the voices further subjugated to the dance. Never mind. What can't be cured etc and certainly nothing needed to be endured, not by me at least. There was a bit of a cuffufle on opening night apparently with someone calling out 'what has this got to do with opera' before leaving. Well, it did say it was by Sasha Waltz and she is a choreographer, and the marketing was driven by photos of swimmers in a tank of water (hard to sing underwater) so most were ready for anything, and hoping for a bit of German naughtiness too I expect. They did get some nice botties and a flash of breasts. The vocals were quite lovely, and I say in all honesty that Deborah York's wide eyed Belinda was pure and honest and of the simplest most satisfying beauty full of innocent charm. It was in the end terrific theatre. I loved it and was quite entranced if not ever really deeply emotionally engaged. The Vocal Consort Berlin was a fine chorus, noticeably when they sang from the stalls right next to us with the sound you wished for all night. The pictures are by Jamie Williams/Sydney Festival from various sources. Doesn't really say much for the show if the Dido wasn't absolutely captivating. The whole work for me is about the Lament and I find everything leading up to that discardable (which no doubt says more about me than it does about Purcell). The images aren't encouraging. 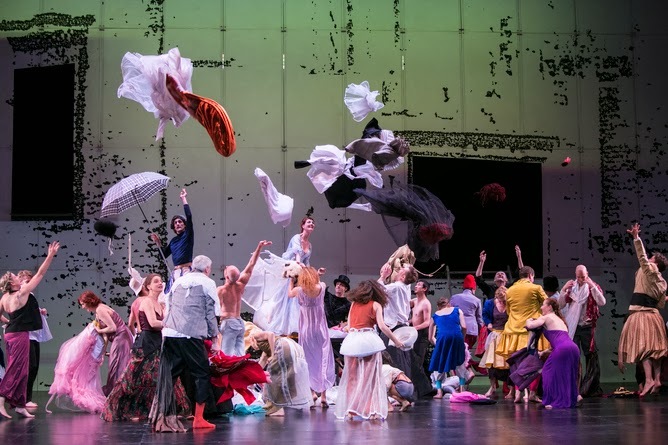 I think we did rather better with Mark Morris in a dress and Sarah Connolly singing very nobly from a box. Glad Debbie was good - of course she was. I only hope the venue wasn't sweltering. Sarah Connolly with anyone in a dress would work for me. The visuals were fine. It was the story telling that was a bit opague. The venue is a newish venue is Sydney's casino, yes you read that correctly. It has good stage and back stage facilities (why it was chosen) and is used mainly for musicals, all miked and mixed - The Producers, Priscilla and the like. Strictly Ballroom (the musical) is next up.